From the creators of the #1 TOEFL course... TOEFL® iBT Exam is Kaplan's comprehensive guide to preparing for the TOEFL Internet-Based Test. This bestseller includes a CD with both an audio and iBT component, Kaplan's exclusive test-taking strategies, and in-depth practice and review for every section of the TOEFL. 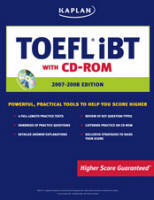 TOEFL® iBT Exam is the most realistic preparation available for the exam. - Full-length diagnostic testing to identify your strong and weak areas. - 4 full-length practice tests with detailed explanations for every answer. - Hundreds of realistic practice questions.In-depth review of listening comprehension, grammar, reading, and writing. - Effective test-taking strategies to help you maximize your score on every section of the test. - CD audio component includes 7 academic lectures and 87 conversations for listening comprehension, plus diagnostic test listening comprehension review. - CD internet-based test component includes 4 full-length tests with score analysis; sample questions; detailed answers; strategies for listening, structure, reading, and writing. Примечание: Здесь приводится только книга и audio CD в формате mp3. Не представлен CD-ROM (175 Мб), так как он в формате iso, и для его открытия потребуются еще дополнительные программы.